'R' stands for Really good! Last year Triumph followed up its tremendous success with the Daytona 675 supersport machine by creating a naked standard based on the Daytona called the Street Triple 675. Triumph knocked one out of the park with that brilliant little hooligan, and now in 2009, the Daytona 675 and Street Triple 675 come closer together in the form of the new Street Triple R. In a nutshell, it has the Daytona's brakes and virtually identical suspension. 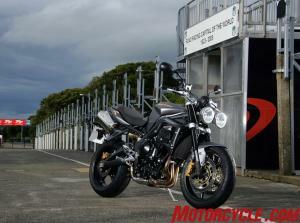 And, yes, it is the Street Triple we all hoped for long ago when the Daytona first hit the scene. The R's radial-mount Nissan brake calipers and radial-pump master cylinder are lifted, unadulterated, straight off the Daytona. Carrying that new master cylinder is a new aluminum, tapered handlebar from Magura. It looks the business and is a good complement to styling and the improved quality of the R. The KYB shock with piggyback reservoir and the fork also come from the Daytona, but on the Street Triple R spring rates and valves have been re-calibrated, and the fork tubes are slightly longer than those on the Daytona. Suspension action is somewhere in between the standard Street, though closer to the Daytona in terms of overall performance. 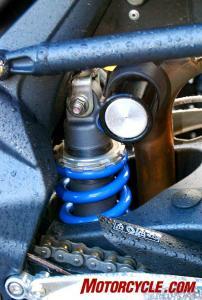 In essence, the R sees full adjustability for the fork and shock, yet it carries slightly lighter spring rates. Dimensionally the R sees nominal changes to steering geometry and a nearly imperceptible rise in seat height (5mm), all of this coming from the new suspension. Finally, two new colors are available for the R: Matte Graphite and Matte Blazing Orange. The orange will be the hot ticket (because it looks great!) color, as far fewer will be produced. Also, the seat, though still with the same thin padding near the nose, now comes in a two-tone gray. Accessories-a-plenty are available for the Street, like the Arrow exhaust, available in either full system or twin high-mount slip-ons. One new accessory for this year is a smoked flyscreen "visor" that attaches to the accessory color matched flyscreens that are available. This new item adds further to the unique look of the Triple while at the same it noticeably deflected the wind without generating unnecessary buffeting. So there we have it. In a nutshell those are the items that separate the R from the standard model. It has the incredibly linear and ultra-tractable engine and the same stout frame and swingarm that the standard model has. Thank heavens Triumph knows not to mess with a good thing when it comes to the frame and absolutely brilliant in-line Triple. 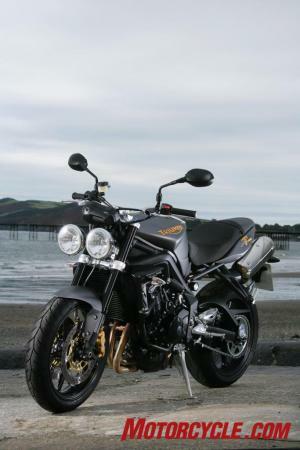 Let's see, if I were Triumph where would I want to introduce an even better version of one of my best-selling bikes of all-time? Hmm... I've got it! 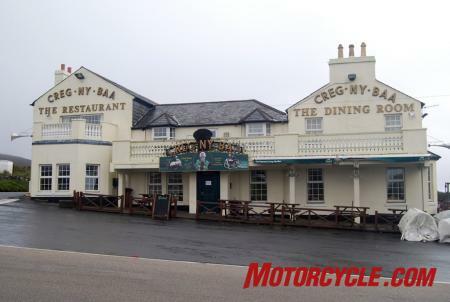 How about the Mecca of true roadracing, the Isle of Man! Yes, envious reader, I'm here to tell you that in fact this is exactly where Triumph brought the world to ride its latest soon-to-be top seller (grant me a safe guess here). The press was first given a guided tour with running commentary from an Isle of Man TT winner, Richard "Milky" Quayle, before being turned loose on the second day. Milky knows every bump, jump, tree, manhole cover, telephone pole, etc on the course so that if he needed to run it blind I'm certain he could. Listening to this highly-excitable fellow give us a complete break down on how to tackle each bend, jump or straightaway (from a racer's point of view!) as we drove along the 37 mile course had me exhausted in the end, as if I had just raced the circuit myself. Although, I'll only ever be able to guess what careening through the pastoral settings of the Isle at 170mph or more must be like. Friends, realizing where I was and that I, too, would soon be rushing down the same narrow, tree- and stonewall-lined road made me misty as I bit my lip to hold back the tearful wave of pure joy. God bless the Isle! 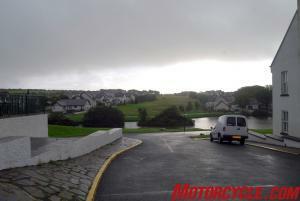 Unfortunately, our ride time the next day gave us a chance to experience "Manx weather." The miserable gray and blowing winds made wet from continual drizzle that so many of us Yanks imagine being the everyday in the U.K. is what greeted us. Thankfully, midday saw drier weather if not clear skies. Riding the new R was exactly what I had hoped it would be and had wished Triumph would have done with the Street Triple in the first place. The extra feel and power from the Daytona's radial-mount calipers is now there allowing for very easy modulation of the more powerful brakes. Triumph techs put suspensions settings to create a more forgiving than usual ride thanks to the rather rough and bumpy nature of the roads on the island. Ride quality still seemed a tad on the harsh side with respect to compression damping, but of course there's a wide range of adjustment so this is a thing to be worked out by each rider for themselves. 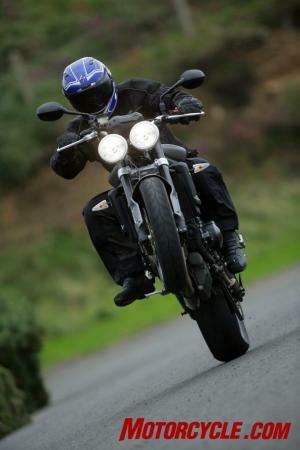 Simon Warburton, Product Manager for Triumph emphasized to us that one of the attributes of the upgrade in suspension is to make the Street Triple a quicker, sharper handling machine. 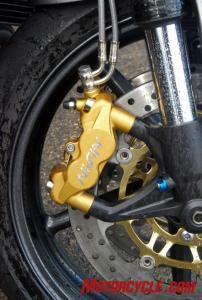 And in that much it is, as the stiffer spring rates as compared to the Standard's allow more aggressive cornering. The R doesn't protest as much when transitioning quickly between turns thereby leading to a quicker ride through the turn. According to Warburton, of the production of the Street Triple for total world wide distribution, roughly 30% will be the R model. 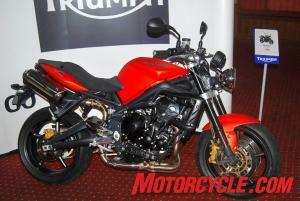 And Triumph USA's marketing manager, Jim Callahan, says that the U.S. should expect to see somewhere around 1,000 Street Triples with the majority being the R version. Hurray for America! The Street Triple 675 R should hit stateside Thanksgiving-ish and is expected to retail at $8,999. In my not-so-humble opinion 1,000 units just isn't enough for us. Not only have I said before that the Street Triple is the bike more Americans should be on, now with the R and its very good brakes and fully adjustable suspenders there's little not to like about what I think is one of the best things to happen to motorcycling in recent years.